Maryland Terrapins guard Dez Wells passes the ball during the Big Ten Tournament semifinal against the Michigan State Spartans at the United Center on Saturday. Largely disregarded going into the season, Northern Iowa and Butler have put together great years. Butler, unranked nationally and picked to finish seventh in the 10-team Big East back in October, placed second in the conference and finished 22nd in both the AP and Coaches’ polls. Northern Iowa exceeded expectations by an even greater margin, finishing 12th in Ken Pomeroy’s ratings (with a gaudy 30-3 record) despite being pegged for 74th in the preseason. Looking ahead to the NCAA tournament, the way both teams are seeded makes them favored to win at least one tournament game, with a puncher’s chance at even more. Great story, right? Well, sure, but our research has shown that even after a stellar season, it’s hard for such teams to completely shake off their humble beginnings. While a team’s statistical power rating will tend to stabilize late in the season, the residue of preseason expectations seems to have a lingering effect. To illustrate, I compiled pre-tourney Simple Rating System (SRS) grades for every NCAA tournament-bound team since the dawn of the 64-team-bracket era in 1985. I also crafted preseason projected SRS scores for each school using a weighted, regressed-to-the-mean average of its SRS ratings over the preceding two seasons.1 When attempting to predict the outcome of a given NCAA tournament game, the difference between a team’s seasonal SRS rating and that of its opponent clearly carries the greatest weight. 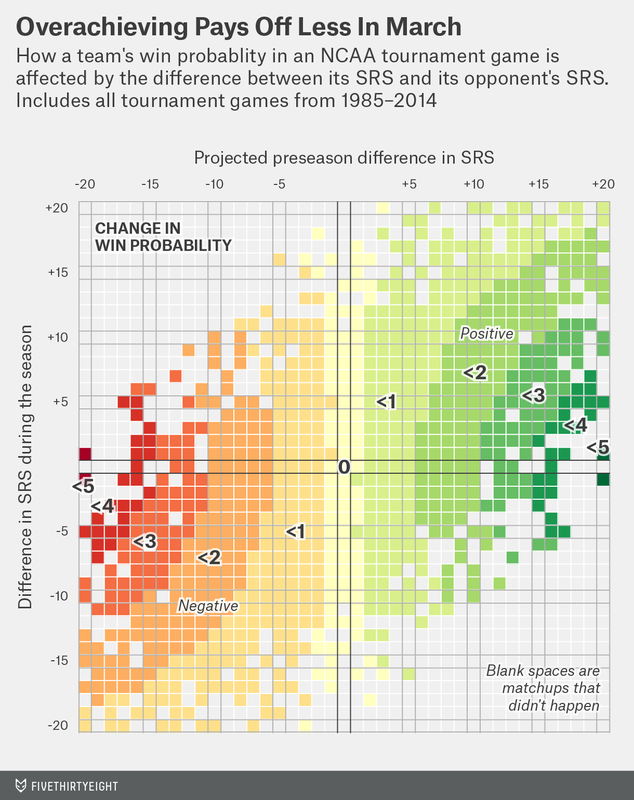 But the difference between the teams’ preseason SRS projections can also alter a team’s probability of winning a tournament game by as many as 5 percentage points. This dynamic even extends to highly ranked teams such as Maryland, who finished 8th in the final AP poll after beginning the year unranked. Teams of that ilk have historically won about 25 percent fewer NCAA tournament games than they ought to have, given where they were seeded. And our model says the Terrapins are on the same track; while No. 4 seeds traditionally win about 1.5 games per tournament, our model projects an average of just 1.2 wins for Maryland in this year’s tournament. For the curious: I gave a weight of 67 percent to the previous year’s score, 22 percent to the team’s score for the year before that, and 11 percent to the NCAA-average SRS score of zero.